Katherine Lee has been writing professionally since 1999, including as a grantwriter and as a consultant, writing policy and evaluation reports for public sector agencies and major foundations. She holds a Bachelor of Arts in molecular biology from Princeton University and a Master of Science in public health from Harvard University. The common and convenient practice of drinking water and other beverages from plastic bottles comes with downsides. You already know that buying a bottle of water costs more than filling a glass or reusable bottle at the tap. Using plastic drinking bottles also produces negative effects on health and the environment. When you hear of efforts to reduce dependence on fossil fuels, you may envision driving your car as the primary way you use petroleum. But every time you buy a plastic drinking bottle, you are also using some of the world’s limited supply of oil--manufacturers use petroleum to make and transport plastic products. Plastic bottle production in the U.S. requires millions of barrels of crude oil annually. Beverage companies then use fuel to transport the bottles all over the world, polluting the atmosphere in the process. The next time you drink a bottle of water, take a look at the label to see where it came from and how far it traveled. Bottled water frequently travels thousands of miles to people who already have clean tap water readily available. According to the Container Recycling Institute, the beverage market share of bottled water increased rapidly from 2 percent in 1997 to 14 percent in 2005. 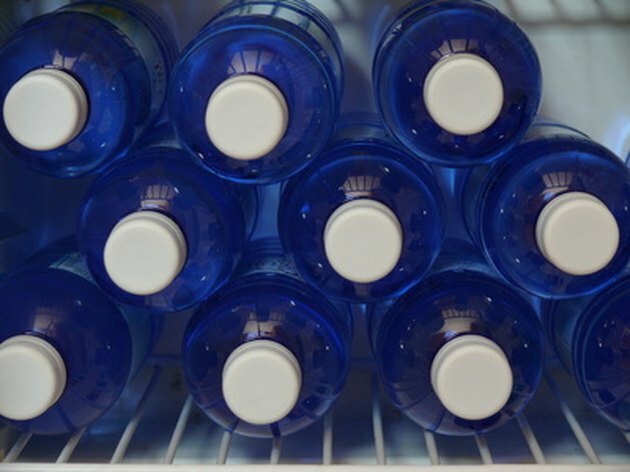 Bottled water has a reputation for being cleaner than tap water, but the Natural Resources Defense Council reports there is no guarantee that it is any better. In fact, the NRDC estimates that at least one in four bottles of water contains tap water itself. The U.S. Food and Drug Administration regulates bottled water by establishing quality standards, but “Consumer Reports” notes that tap water must meet higher safety standards than bottled water, and no law requires companies bottling water to provide safety testing results to consumers or to the FDA. Plastic drinking bottles contain many chemicals, some of which interfere with hormones in the body. These chemicals include bisphenol-A, or BPA, and phthalates, among others. Chemicals in the plastic can leach into bottled water, especially when exposed to heat or when the bottle is old. Different types of plastic—indicated by the number inside the triangle of arrows on the bottom of the bottle—contain different chemicals. Bottlers generally use the type of plastic labeled "1," and identified by the letters PET or PETE. Advocacy groups including the Natural Resources Defense Council and Sierra Club have pointed out evidence of harmful chemicals leaching into food or water and have called for further research to ensure safety. Even though plastic drinking bottles are recyclable, most end up in landfills or as litter. According to Sierra Club, consumers trash a whopping 24 billion of these bottles each year in the U.S. alone. Americans recycle only one out of every six plastic bottles, according to National Geographic Kids. When you throw away a plastic drinking bottle, it will sit in a landfill for hundreds of years without decomposing. The growing piles of our plastic garbage and litter threaten our wildlife and natural areas, making our world a less beautiful and less healthy place. In addition, cleaning up all the litter and trash costs taxpayers hundreds of millions of dollars each year, according to the Container Recycling Institute. When you’re on the go, carry water with you in metal bottles, which are safer than plastic, according to the Natural Resources Defense Council. Metal drinking bottles can be filled—and refilled—with tap water; the metal won’t leach chemicals into your water. If you dislike the taste of your tap water, use a filter to remove bad-tasting minerals. Although water filters cost money, you will save in the long run if you filter water at home rather than purchasing bottled water as your main source of drinking water. The NRDC and “Consumer Reports” provide resources on checking your tap water’s safety.